In this post we review the best Smart Light Switches that work with Apple Homekit. Apple HomeKit is an integrated iOS app from Apple that works on iPhones to provide integrated and connected control of your smart home devices in one app. With HomeKit enabled it also allows you to use Siri to control your smart home devices such as smart lights from your phone using your voice. I personally prefer using Alexa devices for smart home voice control as they don’t require you to be near your phone but HomeKit is an elegant voice smart home control solution is you prefer using Siri. We’ve tested the different types of HomeKit smart switches to find the best smart light switch for you and have ranked them below. We’ve include both Smart dimmers that work with HomeKit and standard on/off smart light switches that work with HomeKit. How Do HomeKit Smart Light Switches Work? There are two ways that smart light switches work with HomeKit, one type of smart light switch directly connects to your wifi network and then connects to home kit though the app on your phone after being installed with manufacturer iOS app. The HomeKit compatible light switches that connect directly to your wifi network don’t require any type of home control hub and are typically the easiest to setup and install. The other type of smart switch that works with HomeKit requires a smart home hub to interface with the smart light switch and your home network. I personally have a few of these in my home and they have worked flawlessly for years without any issues and I have them connected to Homekit (Siri), Amazon Alexa and Google Home for voice control. 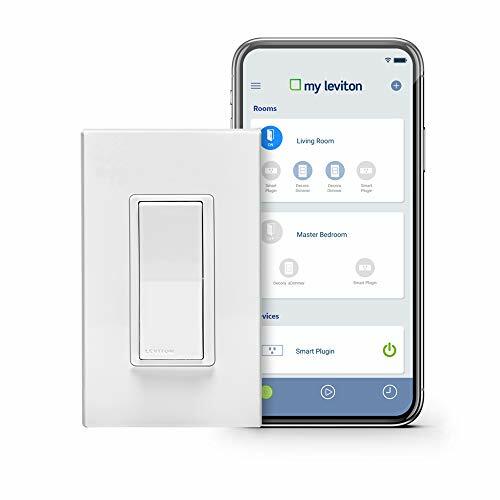 These Leviton smart light switch dimmers connect to standard home wifi networks and are controlled via smartphone wifi app and don’t require any kind of smart home hub. The Leviton app is simple to use and connecting the lights switches to the app is easy, just make sure you follow the instructions to put the light switches into pairing mode when trying to connect to the app. Once you have the smart light switch dimmers connected you can control them through the phone app at home or remotely with just a swipe of the app on your phone. Once they have been setup on the Leviton app, you connect them to HomeKit and these smart light switches are ready to be controlled with Siri voice control. If you prefer to use Alexa voice control the Echo Dot, Echo Show & Sonos One With Alexa built in are great options to control your smart lights with your voice when you are away from your phone. These smart light switches allow you to turn on or off the the light switch with a tap of your finger or your voice. For dimmer control they have well placed side toggle that allows for easy control by tapping up or down to increase or decrease brightness. The brightness can also be controlled from your phone or with voice. These smart light switches can also work in 3 way smart light switch configurations, for the smart light switches to work in a 3 way configuration you will need both the smart light switch dimmer and the compatible smart dimmer “remote” switch which works in the three way switch configuration. Both the smart light switch dimmer and the remote smart light switch (only needed for 3-way light switches) are listed below. One thing to note is that the Leviton Smart Dimmer Light switches require a neutral wire in the switch box for proper wiring. Most homes built after 1975 have neutral wires built into the switches. For older homes without a neutral wire you will need to use smart dimmers that are compatible without a neutral wire. The Lutron Caseta smart light switch dimming kit offers everything you need make your existing light switches smart. The Lutron Caseta smart light switch dimmers all connect to a central hub that can then control any other Caseta smart light switches that you add to the system. The hub then connects to your router and can be controlled via wifi though the app for in home or remote control. The Lutron Caseta smart dimmers also work with both Amazon Alexa and Google Home. The Caseta smart light switch dimmers do offer two unique features not offered by many other smart light switches. The Caseta dimmers don’t require a neutral wire which can be very helpful if you are trying to rewire an older house which often don’t have neutral wires in the switch boxes. Most homes built after 1975 have neutral wires in the switch box but older homes typically do not have neutral wires in the switch boxes. The Caseta smart dimmers also work with caseta pico remotes which are actually battery powered but look the exact same as normal light switches. This means that you can turn any switch into a three way switch even without rewiring the switch because you can just mount the pico remote on the wall and connect it to the hub and it will enable three way switch functionality through programming in the hub. If you already have a three way switch and want to use the Caseta smart light switch dimmers you can just wire the circuit so that only one switch in the 3 way circuit is controlling the on/off function of the lights and on the other side of the circuit you will remove the old switch and cap or connect the wires as needed in the junction box and install the caseta pico remote where the old switch was and it will look identical to the fully wired smart light switch on the other side of the circuit. This smart light switch from Leviton is almost identical to the #1 light switch on this list, it works the same way and is from the same manufacturer, it works on the same Leviton app and is a HomeKit compatible smart light switch just like the dimmer switch. The only difference between this light switch and the #1 light switch is that this is not a dimmer switch, however it does have the same styling and lines so if you choose to replace the majority of your light switches with the Leviton Smart Dimmer Light Switches this one will fit right in. This HomeKit Smart Light Switch works on wifi and does not require a smart home hub to work, it will connect to your standard wifi home network. 4. Lutron Caseta HomeKit Compatible Smart Light Switch (On/Off) Style. 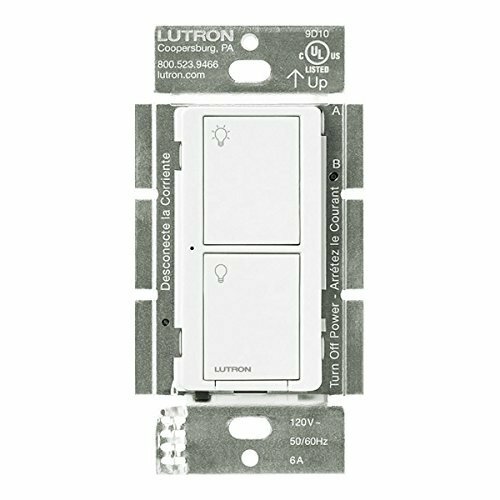 This Lutron smart light switch works with the Lutron Caseta smart light switch system just like the #2 light switch on this list. This (On/Off) Lutron Caseta smart light switch works just like the Lutron Caseta Smart dimmer except it does not have dimming capability. 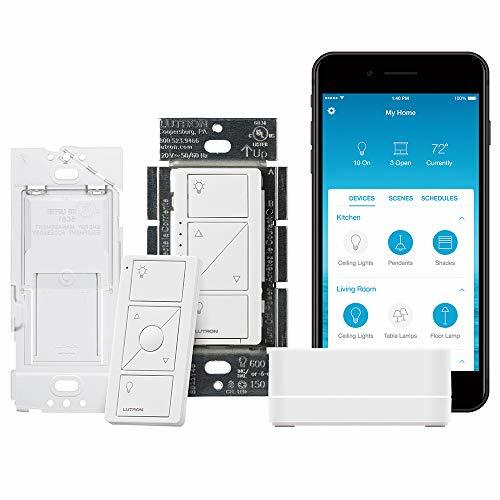 This HomeKit compatible smart light switch requires the Lutron Caseta smart home hub to work and connect to your home network and HomeKit but one Lutron Caseta Smart Home Hub can operate up to 50 HomeKit compatible light switches on one hub. These smart light switches are compatible with 3 way smart lighting control by using pico remote controllers and can also be used in installations where there is not an existing neutral wire in the switch box. We don’t recommend these switches as they don’t offer the same features as the a other HomeKit compatible light switches listed here but they do work with Apple HomeKit and and will allow you voice control of your smart light switches with Siri and phone control of your smart light switches. The Eve Smart light switches work on bluetooth which provides a major disadvantage over the other types of light switches we have listed. 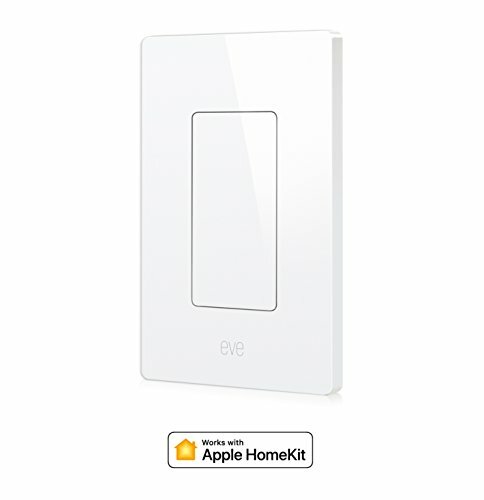 While the HomeKit compatible Eve smart light switches will work with Siri they are range limited with bluetooth, they directly connect your phone with and not the wifi network which means you can’t control them without your phone, if your phone is off or when you are out of range or away from home. The other recommended light switches we list all allow remote control of your lighting even if you are outside of your home, at work or on vacation, they also allow voice control remotely without the need for your phone to be near you or powered on. We are listing this light switch because it does work with HomeKit but we think you are much better off with one of the other smart light switches options that works with HomeKit because they offer more functionality and better features. Both the Leviton and Lutron smart light switches are great HomeKit compatible smart light switches and will work with Siri, Alexa and Google Home voice commands. We recommend the Leviton Smart Light switches as the #1 choice because they don’t require a smart home hub and work on standard wifi networks. However if your existing wiring does not have neutral wiring in the switch boxes the Lutron Caseta light switches are a better option because they don’t require a neutral wire and will allow you to utilize your existing wiring without the need to add a neutral wire which can be a big project in some cases. I created One Hour Smart Home to help people automate their lives. After years of owning and running A smart home installation company I’ve realized that the information we’ve learned can be helpful for people who want to take on smart home projects on their own. We provide you with the information you need to automate your home. I enjoy the outdoors and have been an avid boater my entire life, it’s hard to keep me off the water when the weather it nice. I love learning about new smart home technologies and sharing it with you.